There are a few general points that apply to the campsites reviewed here and which it is worthwhile knowing about. All these campsites take both tents and caravans/RVs, but Camping Colfosco and Camping Olympia are more orientated towards caravans/RVs in how they are set up. This means lots of bays to park a caravan/RV and quite a few static caravans/RVs with small, wooden buildings attached. This isn’t necessarily a problem, but does mean you shouldn’t expect a big grassy field full of tents. The plus side of this emphasis on caravans/RVs is that the ground is pretty flat and level and there is no difficulty finding somewhere to park your car near your tent. It is important to note is that the ground in these campsites is hard and full of rocks. For me, this has meant bent tent pegs and most of the pegs only half in the ground. 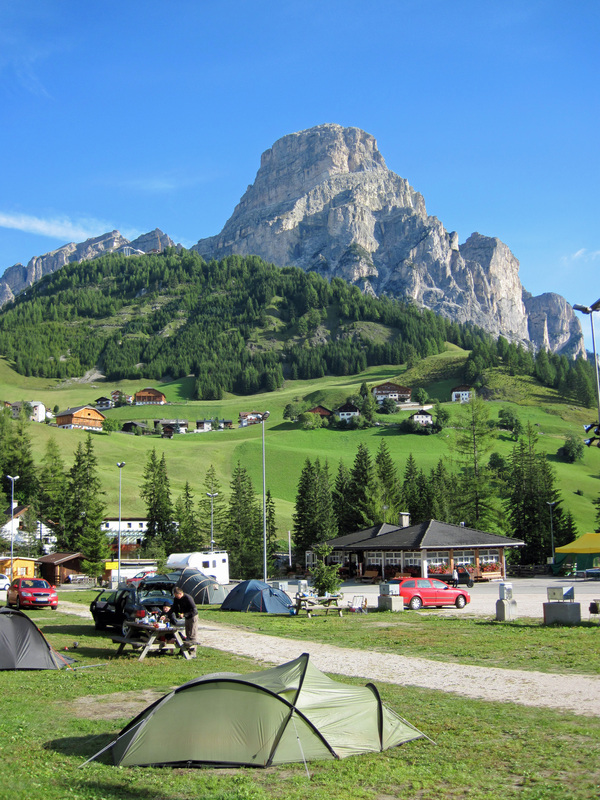 Camping Alta Badia is not too bad in this respect, but at Camping Colfosco and Camping Olympia it’s worth looking out for the grassy areas. These grassy areas are not that big and not necessarily obvious, but they are where the campers tend to congregate and pitching on these might be less hard. Both Camping Colfosco and Camping Olympia have gates that are closed at night. Arrive later than 9 or 10pm and the gates are likely to be down and the offices shut. However, you can always leave your car outside, walk in with your tent and check-in the next morning. Summary: An excellent location for via ferrata, scenary and restaurants and shops. It is clean and has good facilities. 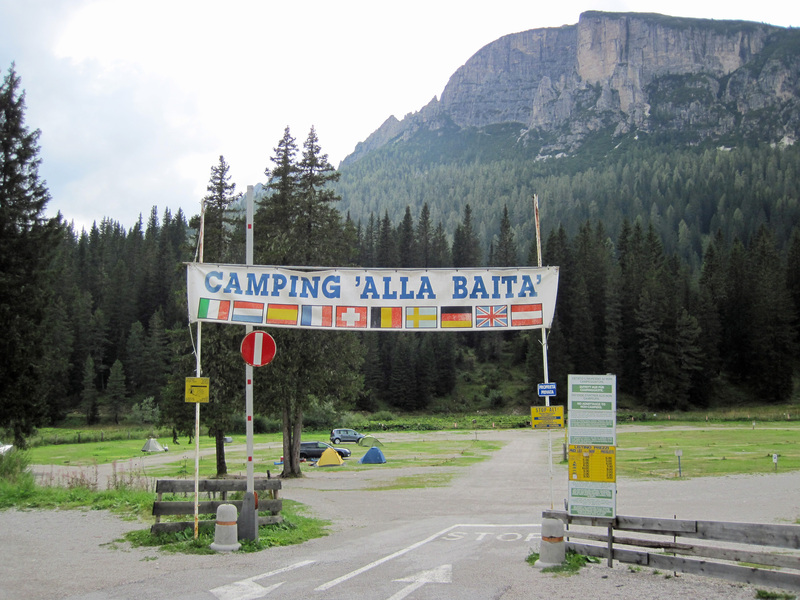 Camping Colfosco is in the Alta Badia region of the Dolomites. It sits roughly half way between Corvara and Colfosco on route 243. A clear sign indicates where to turn off route 243 and you follow this road for about three hundred metres to arrive at the campsite. I arrived at Camping Colfosco at night and so had a real “wow” moment when I unzipped my tent the next morning and looked out at the stunning mountains surrounding me. It was also great to begin that morning (and all the others I stayed there) by getting a good Italian coffee from the café on site. In addition to the café there is a small shop that sells basic food and toiletries. The toilet and shower block is well maintained and equipped (including dry clothes hanging space within the cubicles) as well as being kept clean. There are also large laundry facilities. Although the name implies it is close to Colfosco, I think it is probably easier to get into Corvara than Colfosco. It is about a ten-minute walk into the town of Corvara either by the road or by taking a pleasant path by the river. Colfosco is slightly further away and, with no obvious path and a twisty road the only thing to follow, is easier to reach by a short car journey. Both Colfosco and Corvara are attractive little towns with restaurants and shops, but Corvara is the bigger of the two. Corvara has a couple of small supermarkets, a large sports store and a fair selection of reasonably priced restaurants. This area is a great base for getting to some excellent via ferrata. Camping Colfosco is near the road (route 243) that runs up to Passo Gardena and this means that there are several good via ferrata a short drive away. In particular, it is only about five minutes drive to the car park for the absolutely superb and classic Via Ferrata Brigata Tridentina. Continuing to drive over Passo Gardena takes you to Selva and other excellent via ferrata. In the other direction a cable car and then a chairlift from Corvara can take you up to the via ferrata in the Sella Massif. Other good areas for via ferrata such as Arabba and Passo Falzarego are also not too far by car. Summary: a convenient location for a couple of good via ferrata and in reach of many more. However, there are limited facilities on site and most of the pitches are on bare earth. 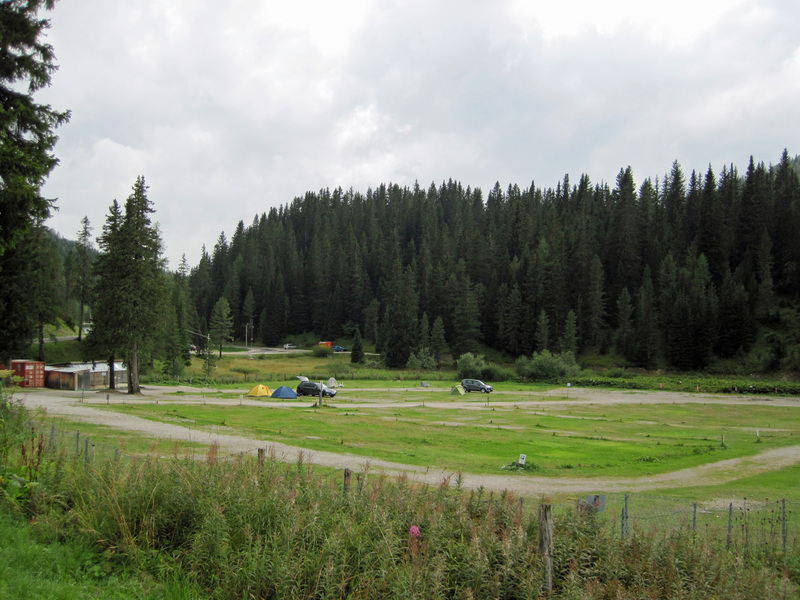 Camping Olympia is just outside Fiames, about ten minutes drive out of Cortina d’Ampezzo on route 51. It is located in the trees next to the River Boite. A large sign indicates a narrow road to turn down to reach the campsite. This road crosses the River Boite and quickly afterwards a turn right takes you to the campsite’s entrance. The best thing about Camping Olympia is that two good via ferrata start within walking distance – Via Ferrata Ettore Bovero (going up Col Rosa) and Via Ferrata Michielli Strobel (going up Punta Fiames). As it is only a short drive from Cortina, Camping Olympia is also convenient for the good range of via ferrata around Cortina and in Passo Falzarego. Although Camping Olympia has a restaurant, this is only open during the winter ski season and therefore not ideal for via ferrata trips. There is a tiny and not particularly well-stocked shop in the campsite, as well as a drinks machine that serves truly terrible coffee. There is only one, basic bar in neighbouring Fiames. This means it is necessary to drive to the major town of Cortina for shopping and to get something to eat. Camping Olympia does have a couple of adequate washrooms and laundry facilities, however, I was not particularly impressed when they shut one washroom for most of my stay. I suspect this was because they did not want to have to clean two washrooms every day. The river that runs past the campsite is pretty and many people seemed to pitch on the grassy area nearby (behind the main restaurant and washroom block). Away from the river bank the pitches are incredibly dusty, and combined with rain, can get your tent rather dirty. Summary: a fairly basic, but good, campsite within easy walking distance of restaurants and shops. It’s near a pretty lake and close to some good via ferrata. 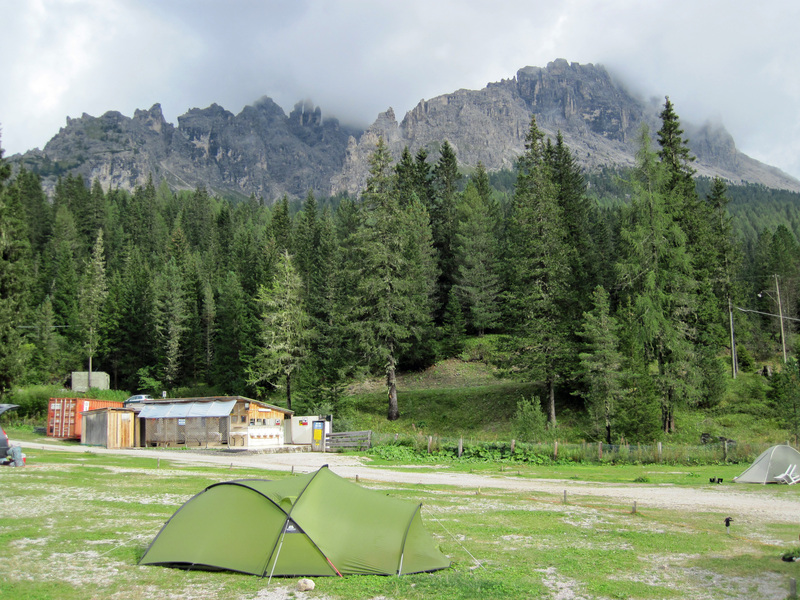 Camping Alla Baita is the only campsite in Misurina, in the north eastern Dolomites. Misurina is a small village that follows one shore of a pretty lake and is about half an hour’s drive from Cortina. Camping Alla Baita sits at the northern end of Lago di Misurina and is only a couple of minutes drive off Route 49. There are signposts to the campsite on Route 49 and Misurina is so small that it won’t take you long to find Camping Alla Baita. Camping Alla Baita is essentially a single, gently sloping field a couple of minutes walk from a lake and with pretty mountains surrounding it. It’s pretty large site with stakes and tape marking out demarcated areas for tents, caravans/RV and parking. Woods, a couple of roads and a marsh that feeds the lake border the campsite. The grassy area near this marsh is prone to flooding in particularly heavy rain. As this grassy area is also the most horizontal part of the campsite, this is where I pitched on the first night of my stay. Torrential overnight rain forced me to move my tent out of a puddle the next morning. However, the grass and gravel that make up the site generally seem to drain well and it’s nice to pitch on. There is a building with toilets, showers and sinks for both personal washing and laundry. The sinks for personal washing aren’t inside the building, but along the outside and protected from the elements by the gable of the roof and a strange construction of trellising and plastic sheeting. The showers are down a dark corridor that is open at both ends. These semi open-air wash facilities are probably fine in warm weather, but during the often cold and wet weather of my stay I would have preferred more walls and doors. Despite this, the washing facilities are generally fine, with warm water, decent showers and a good standard of cleanliness. There is no shop at Camping Alla Baita, but there is local information at the office, including weather forecasts. Ristorante AIla Baita is just over road from the campsite and is probably owned by the same people. It was never obviously open while I was there (although this was towards the end of the season) and so I can’t really say much about it. It is also only a five minute walk into the village, where there are a few restaurants, a small, but good, supermarket and a couple of very small gear shops. Camping Alla Baita is perfectly located for local via ferrata and a good base for exploring the surrounding mountains. In particular, it is about five minutes drive from the start of the toll road that leads up to Rifugio Auronzo and the stunning Tre Cime. From Rifugio Auronza it’s possible to walk to the brilliant Via Ferrata Delle Scalette, Sentiero Del Curato Militare Hosp and the Sentiero de Luca/Innerkofler. In addition, Camping Alla Baita is just across the road from where you can get a jeep taxi up Monte Piana, a fascinating open-air, World War 1 museum that includes the Via Ferrata Bilgeri. The via ferrate around Cortina are also in easy reach by car. Thanks. Glad it was useful. It was useful, thank You! We are planning to go there with kids this summer. Thank you. I’m really pleased that it was useful. can you remember how much they charged please? Thanks for getting back to me. I went to this campsite about 25 years ago. It does not look like its changed. We are heading that way with the family in June. This is great– it seems fairly difficult to find info on straight-up, not-resort-style camping in the Dolomites. Thanks for sharing! Thanks Holly. I’m pleased it was useful. Hi, Very helpful information. Did you reserve a spot for your tent or just show up? I just turned up. However, that was in early September, at the end of the summer season and when kids were back at school, and it might be that I could do that because it was less busy.